The Udmurt Republic is a sovereign republic within the Russian Federation. It is situated in the Western part of the Middle Urals between two great rivers the Kama and the Vyatka. In 1991 the republic became open for foreign visitors. Since that time Udmurtia has had close and friendly relations with many countries of the world in the fields of culture, education, trade, sport and tourism. The Government of the republic is very much interested in the development of local tourism. Peoples of various nationalities live in the republic: the Russians, the Udmurts, the Tartars, the Ukrainians and others. The official language is Russian. The Udmurt and Tatar languages are also widely used. Due to the geographical location the climate of Udmurtia is continental with long cold and snowy winters and relatively short warm summers. About 44% of the territory of the republic is covered by forests. Among local flora, one can find both European and Siberian vegetation. The animal world of the republic is very rich and various. Local forest animals are the foxes, martens, ermines, badgers, wolves, bears, hears elks, squirrels, etc. Hunting and fishing are very popular in the republic. Udmurtia is rich in oil and gas. The republic is also very rich in medical muds and mineral water springs. Very often people call this republic "a spring region". Medical muds and mineral water are widely used for medical purposes in spas. The national park "Nechkinsky", which spreads along the banks of the river Kama is famous for its beauty and tracts a lot of holiday-makers. Izhevsk, the capital of the republic, is the industrial, scientific, economic and cultural centre with the population of about 700 thousand people. 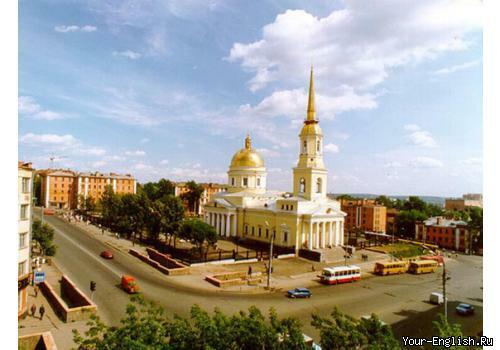 The city was founded in 1760 on the banks of the river Izh as the settlement attached to the iron producing factory. In 1807 the arms producing factory was set up on the basis of the iron works. Since that times Izhevsk has been one of the most important arms manufacturers in Russia. There are several theatres, museums and cinemas in Izhevsk as well as the circus (which is considered to be one of the best now) and a philharmonic society. Such folk song and dance groups as "Italmas", "Aikai", "Tanok" are very popular and have a great success both within the country and abroad. There are beautiful parks and gardens, churches, monuments and a cathedral in Izhevsk. Izhevsk is a city of students. There are several higher educational institutions in it, including three universities. The great Russian composer Pyotr Tchaikovsky was born in Udmurtia in a small town of Votkinsk. The house where he was born and spent his childhood is a museum now. Every year in April the Tchaikovsky Musical Festival attracts a lot of admirers of classical music. And also it's famous for Michael Kalashnikov, the greatest constructor of guns, who lives and works there.